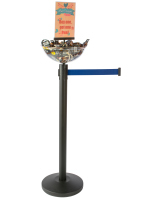 From the old-fashioned favorites to the new flavor swirled soft serves, everyone loves a trip to the ice cream parlor! 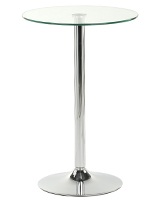 Many of us have fond memories of visits to these establishments, also called parlours, for a special treat as children - like a banana split with whipped cream and a cherry on top! 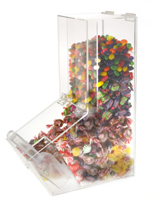 As a business owner, you'll want to choose the ice cream displays that turn your parlor into a lively place where children love to be! 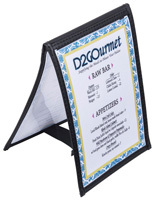 From tables and chairs, to topping dispensers and candy bins, Displays2go has the ice cream parlor displays and supplies you need to create a fun and inviting business for all your customers! 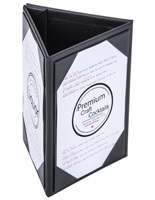 More Capacity (ounces) Options Available! 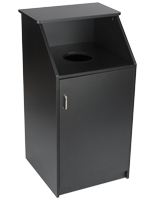 Whether it's a window, a register stand, or an old-fashioned malt bar, the service counter is the first place customers head to when they enter your shop. 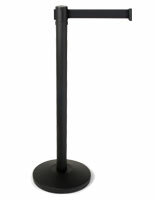 Because the checkout area is so prominent in the store, you'll want to outfit it with the ice cream displays that fit the part. 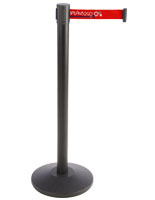 The ice cream parlor counter should look good, while also making the scoopers and waitresses jobs easier and more efficient. 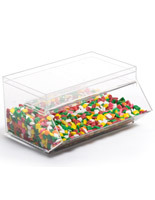 For example, you can use clear acrylic candy bins for holding toppings like sprinkles, M&M’s, chocolate chips, cookie crumbles, or nuts! 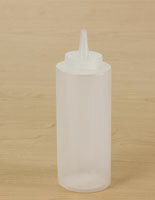 These ice cream shop supplies are great because customers can easily tell what novelties the containers are holding. 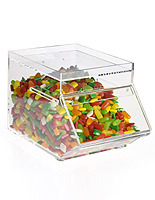 Most of these topping bins also have easy-open lids for dispensing from the clerk's side. 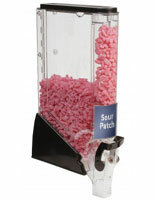 For popular ice cream toppings that seem to fly off the shelf, try one of our large-capacity gravity food dispensers. 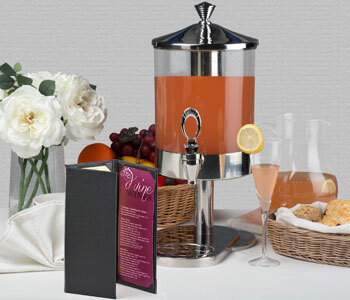 Simply turn the handle on the dispenser to pour out delicious candy or sprinkles! 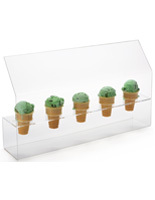 For freshly made waffle cones or other yummy treats, try one of our bakery display cases that sit right on the countertop. 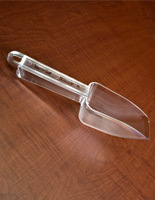 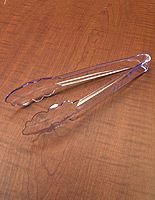 Shop owners can even use a couple of our decorative wire baskets for holding napkins and spoons nearby. 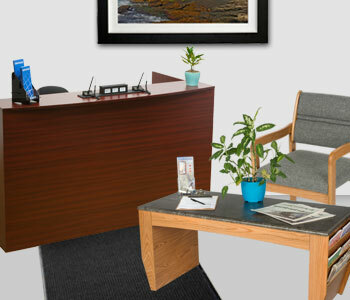 Once your customers leave the counter with their ice cream cones in their hands, they'll need a place to sit and enjoy their treat. 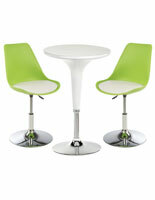 Our line of ice cream parlour furniture is comfortable and modern, great for a frozen yogurt shop like Pinkberry or Orange Leaf. 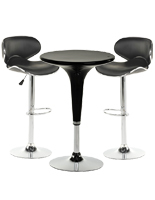 The vast array of options allows shop owners to choose the ice cream parlor tables and chairs that complement the existing décor. 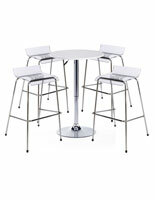 We carry an incredibly popular line of bar table sets that are perfect for more modern yogurt shops and ice cream stands! 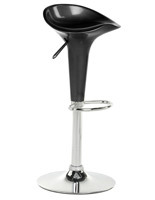 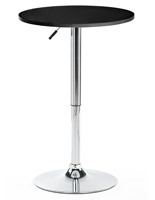 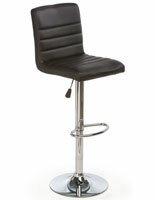 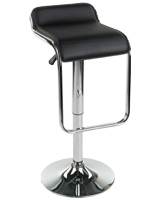 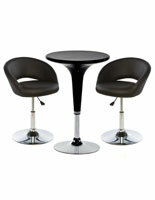 Each set comes with one height adjustable bar table and two ergonomic seats. 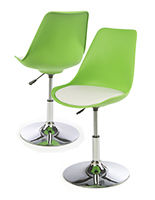 There are a variety of colors, finishes, and styles to choose from, so you're bound to end up with frozen yogurt shop furniture that not only fits your business but also your brand! 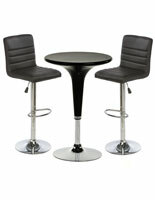 If you don't quite need the whole set, the chairs and tables are sold individually as well so you can outfit a long bar with several stools. 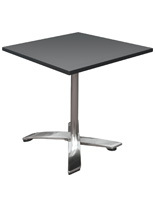 We also offer a range of lightweight folding tables that are great for outdoor seating areas. 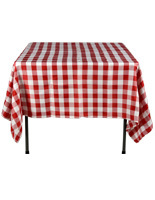 Pair these fixtures with checkered tablecloths or spandex stretch covers to really impress your customers! 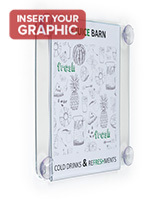 Customers commonly stand in line for a frozen treat, indecisively scanning the menu boards, jumping from flavor to flavor, completely unable to decide on your order. 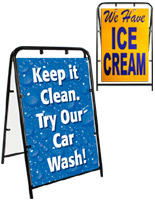 It's bound to happen simply because there are so many options, but luckily these ice cream shop signs will not only help existing customers decide on a gelato flavor, but will also draw in new customers! 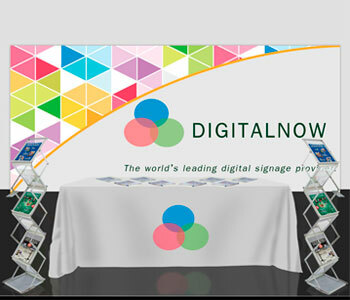 Consider using a printed flag or banner to advertise to passing motorists or pedestrians. 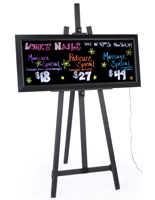 Or, set up a chalkboard sidewalk sign to promote changing specials and deals at street level. 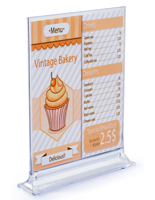 Up at the service counter, ice cream parlor signs are great for listing various flavors and menu items. 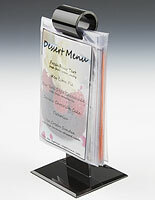 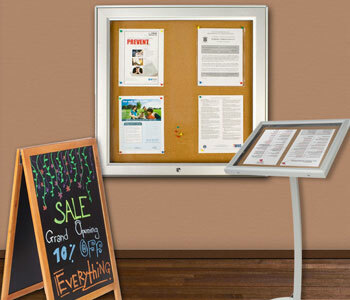 Menu holders and flip chart displays are frequently placed on individual tables to showcase special offers, seasonal flavors, and other unique promotions. 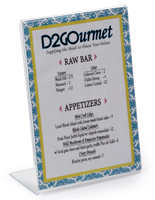 Placing these table tents right at eye level is a sure-fire way to generate more interest and sales from customers. 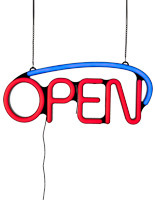 You might even choose to place a lighted LED sign in the parlor's window to show when the business is open. 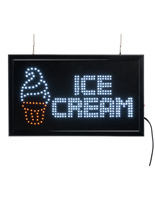 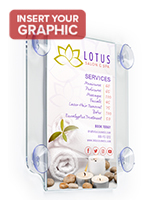 There's no limit to styles of ice cream shop signage that will come in handy at your business! 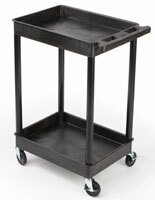 If your ice cream business is booming and you have long lines out the door every night, then you may need some of our helpful site furnishings. 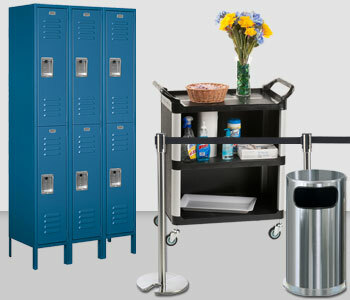 Our line of stanchion posts with retractable crowd control belts is perfect for keeping your waiting customers orderly. 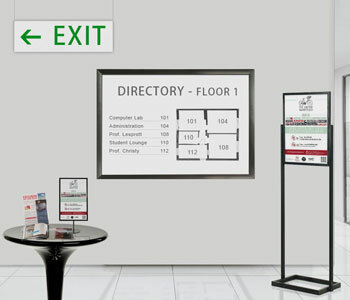 We also offer door mats with custom printing for entry ways, janitorial carts, and trash receptacles. 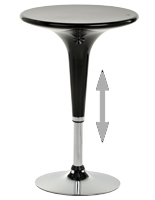 For ice cream stands with outdoor seating, check out our selection of patio umbrellas! 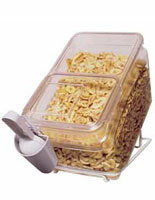 These canopies are always popular on a sunny day and can help stop your frozen snacks from melting too quickly! 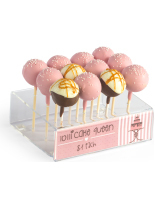 Many of these umbrellas are customizable, so you can tailor yours to match your ice cream shop's logo with little effort. 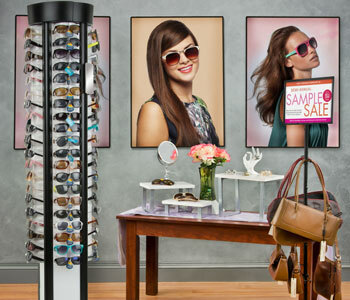 With these products, you'll be able turn a typical business storefront into a welcoming place that everyone, young and old alike, will love to go for their sweet summer treats!